On October 18, poet and literary critic Adam Kirsch delivered his lecture “Poetry and the Problem of Politics” as part of the annual Flora Plonsky Levy Lecture at the University of Louisiana at Lafayette. Kirsch explored how politics can both inspire poets and shape the way we read poetry, examining Percy Bysshe Shelley’s “Defense of Poetry” and “England in 1819,” W. H. Auden’s poem “September 1, 1939,” and John Milton’s Paradise Lost. I was at first reluctant to attend Kirsch’s talk because I don’t consider myself to be a political poet. There have been many times, in the last couple years especially, where I have given in to the urge to respond to political issues in my poetry, but every attempt comes off flat for me. I often feel like anything I write will serve no purpose and essentially be “preaching to the choir,” accomplishing nothing, and simply fulfilling my own need to do something. I realize though that my choice to write or not write poetry that engages with politics is a result of my privilege. For others, it may not feel as though they have a choice and that writing poetry is a chance to have their voice heard. Kirsch reflected on the role of poet as future lawmaker and as someone who has the ability to write about a potential future in radical ways, saying poets are the “unacknowledged legislators of the world.” This made me realize that many poets (including myself) are actually engaging with politics in their poetry, without making direct connections to headline news or the latest Trump tweet. 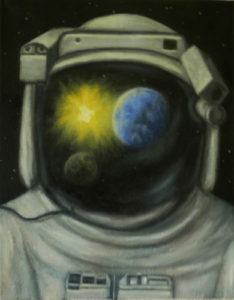 My latest poetic project features a lonely astronaut, floating in space, falling in love with planet Earth. Without really intending, many of my poems from this astronaut’s voice are political and make connections to climate change and international borders. I left Kirsch’s talk wondering, though, if what I write is enough. Another role poets have historically taken in politics, Kirsch remarked, is reactionary. Reflecting on the way Milton’s Paradise Lost portrays Satan, Kirsch discussed the role of poet as “doomsday prophet,” arguing that Satan takes on the role of the liberator. Thinking back on my work and the responses I’ve gotten from readers, I realize I may be taking on this role, as well, and that it comes with a responsibility that I have not been acknowledging. Some readers of my lonely astronaut poems have asked why the astronaut is alone, why she doesn’t seem to be able to return to Earth, drawing the inevitable conclusion that Earth is somehow damaged and is no longer a suitable home. I really hadn’t thought about this and was willing to let the reader come to their own conclusions. But this feels lazy to me, now. In this poem, Kirsch argues that Auden “situates himself in the world” and is present, “watching and recording,” acting as a witness. Hearing Kirsch discuss his third point, about the poet as witness, struck a chord for me. 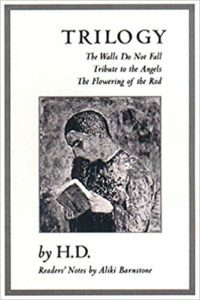 I have been reading H.D.’s book of poetry Trilogy and I think the way she engages with politics and the war-torn world around her would fit in nicely with Kirsch’s points about Auden’s work. Reading Trilogy after hearing Kirsch speak has shaped the way I experience the poems. H.D. wrote Trilogy while she was living in London when the city was bombed during World War II. In her poems, she asks the reader to worship the figure of the woman as poet, as goddess, as a powerful religious figure. She also uses her surroundings as inspiration for her work, resulting in a kind of record of the bombed-out London landscape. She writes, “An incident here and there, / and rails gone (for guns) / from your (and my) old town square:”. Later in the same poem, she describes the ruins of buildings and connects them to the mind laid open by grief and trauma, where “thoughts stir, inspiration stalks us / through gloom:”. If H.D. had not engaged with politics in her work, she would be ignoring the immediate issues of the world around her, essentially writing in a void. I think this is something I and other poets should consider as we continue to write in our current political climate. What did my lonely astronaut experience before she left Earth and how can those experiences be a record she carries with her to new worlds? I think attempting to answer these questions by acting as a purposeful witness can not only add to my poetry, but also be a form of protest.